Update: My 2006 boat is sold but I have a neighbor selling a 2007 B2 with an Etec 60hp motor with just over 100 hours of use. 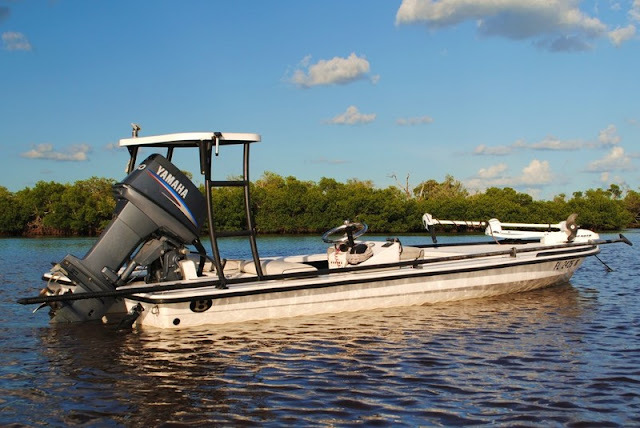 This boat is in fantastic condition so feel free to give me a call at (239) 565-2960 if you'd like to see it or take a test drive in the newest BT3. This has been my personal guide skiff for the last five years. It has a 50 HP Yamaha 2-Stroke with just over 800 hours. There are a lot of extras that will go with this boat, including brand new SeaDek, and you can read about them here. ﻿You can also read a short review about this boat here. I'm asking $15,000 which is a good price for a perfectly maintained boat like this. There are very few B-2s on the market right now and this is the lowest priced one available. You won't find a more capable boat at twice the price. Test drive this 550 pound skiff and then go look at any Hell's Bay or a Maverick HPX. You'll be amazed at how much the Beavertail gives you for a lot less money. Please e-mail me at gmckee1@hotmail.com or call me at (239)565-2960 with any other questions or to arrange a showing.